Here at Premier Seals Manufacturing we have years of experience working with non-metallic materials in the manufacturing of gaskets, seals, and other products. We work with our customers every step of the way to make sure that the products we produce are products that will fit with their unique application and meets their specifications. We strive to maintain high quality products in addition to premium customer service. We offer high quality die cut gaskets in a variety of materials, all depending on our customers’ needs and specifications. We pride ourselves on working with our customers to gain an understanding of their process and application before we go to the prototype phase of our process. 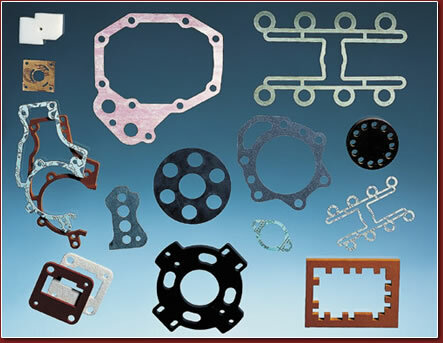 We do this because we specialize in custom die cut solutions such as gaskets and seals. We work with a wide range of industries including chemical, medical, automotive, aeronautical, marine, military, building, industrial, and many more. A gasket is a mechanical seal used to fill in or pad space between two objects. Gaskets come in a variety of custom shapes and sizes and can be fabricated from customer specified materials such as EPDM gaskets or Neoprene gaskets. Typically they are used to prevent leakage between two objects while under compression. We make some of the highest quality gaskets on the market, and we do so by listening to your needs and specifications. We know that in order for a gasket to work properly it must fit the application precisely. The cutting of gaskets, also known as die-cutting, is the precision fabrication or conversion of selected materials in sheet or roll forms into the desired shape and size. This process is used in order to produce a custom product that will fit your needs and application precisely. Premier Seals Manufacturing professionals are ready to assist with the creation of custom gaskets that meet the exact needs of your upcoming project from design to engineering to final delivery. Our gasket cutting services have a number of advantages for our customers including short and long run production, fast prototype delivery, precision low tolerance cut gaskets, and material selection. We understand a variety of different industries and applications; we know that not all applications require the same material which is why we are happy to say we can offer a wide range of materials including Neoprene, Viton, EPDM, Natural rubber, Nitrile, Silicone, SBR, and Urethane. Regardless of the size of your order, Premier Seals Manufacturing looks forward to hearing about your application and specifications so we can provide you with a quote for your next project. We pride ourselves on having outstanding customer service every step of the way from working with your design team to final delivery of the product. We maintain communication so you know that the product you receive is going to be a product that will fit your unique application and process. We have the technical knowledge in rubber manufacturing to benefit your company and suggest the best possible solution for your next project dealing with non-metallic materials. Contact us today to find out how we can benefit you.